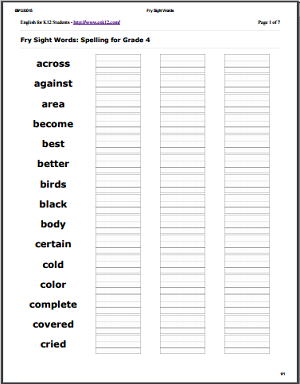 Fry sight words list is widely used by elementary school teachers and parents to develop children's vocabulary skill; here you can get words grouped by grades as well as thousands of printable PDF worksheets for Fry words practice and assessment. 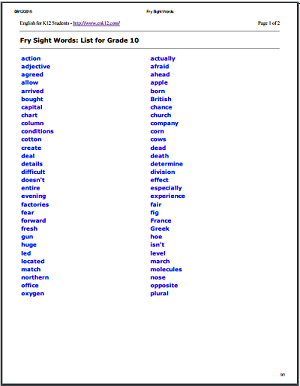 Fry sight words list, also known as Fry instant words list, is widely used by elementary school teachers and parents. Dr. Edward B. Fry summarized the list of the most common words used in grade 3 to 9. The 1000 words list, which is the base and the start point of further study, is critical for kids to success in elementary school. Fry sight words list is supposed to cover reading of grade 3 to 9, but students usually should own these words before in grade 6. A common suggestion is to finish Fry 300 (the first 300 words) in grade 1, 2, and 3; Fry 600 (actually the second 300 words) in grade 4; and the rest in grade 5. This app follows the pattern and assign words into 5 grades to drive learning. 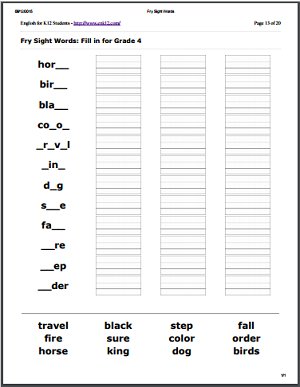 Another famous sight words list, Dolch list, is smaller and based on reading from kindergarten to grade 2. For students over grade 2, we strongly recommend to study Fry sight words list. Grade 3, 4 and 5 are the right time to focus on Fry words list learning. The app is designed to help teachers and parents to guide Fry words building. 1000 Fry words are categorized into 10 groups by convention. Each group has 100 words and is divided into 4 lists. 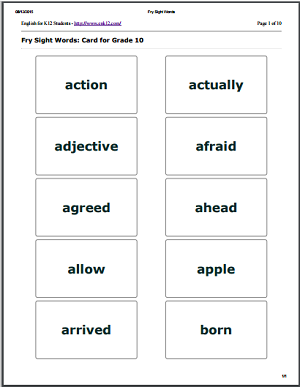 Try some Fry words of your grade, and have a quick view for their flash cards. It's just a few clicks to launch either online or offline resources of the app. We demonstrate more features and PDF worksheets through below pictures, click and enjoy them!